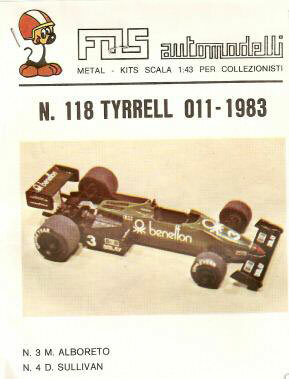 This is the Tyrrell 011 that was used for most of the 1983 season. It arrived as a “gift” with another model I purchased off ebay a couple of years ago. I couldn’t do much with it until some replacement decals were sourced, after which I was able to rebuild it, pretty much from scratch. 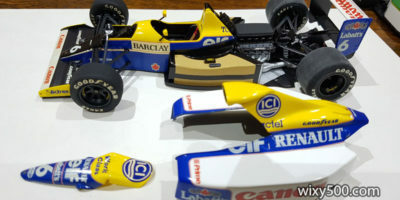 The registration of the replacement decals is not as good as the old yellowed ones on the model, but hopefully the car as a whole will look better once rebuilt and repainted. Looks like it’s had a crash! Other than a roll hoop, I think all the parts are there. 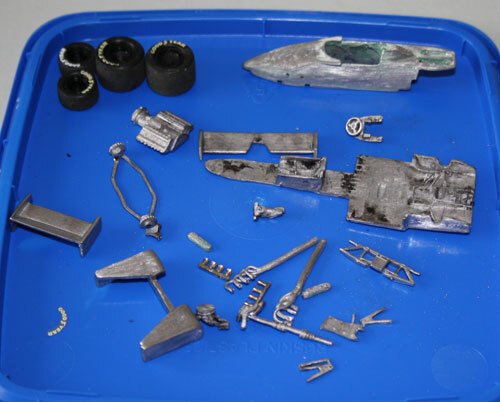 Body parts cleaned up and primed (I’m giving Tamiya Surface Primer a crack on this one). 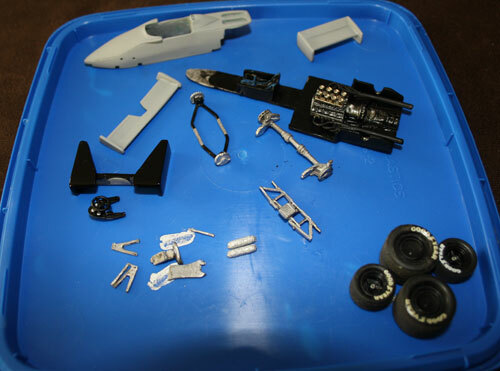 Engine and exhausts have been glued to the base plate; sidepods, floor, engine/gearbox, dash and seat are painted. I found this pic on the internet – an original FDS instruction sheet showing a completed example. 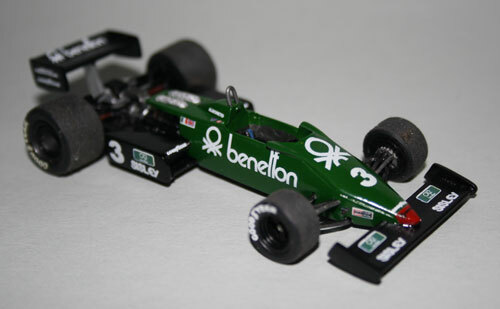 There were a few different variations of the ‘011 during the 1983 season. 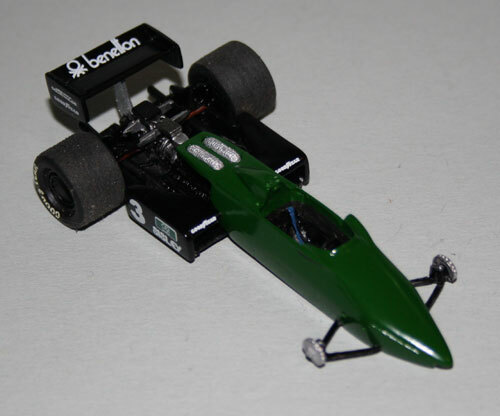 My version will be as per FDS modeled, which I believe is from very early in the year: the rear wing top element is black (not green), the body is all green (in some races the bottom half of the monocoque sides were black), the exhausts exit low, under the driveshafts (in most photos of the real car, they exit over the top of the rear suspension). I think FDS got the rear suspension wrong as the model has top rocker arms suitable for springs mounted behind the driveshaft, whereas the 011 had the rocker arm and spring in front of the driveshaft. 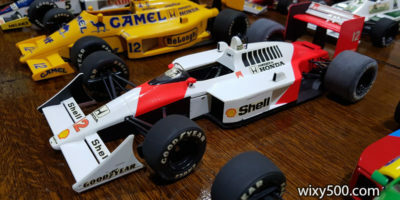 Tameo has also modeled this car and it is a far superior version with a better and more accurate casting, the high exhausts, correct suspension, etc. Wings and sidepods decalled. 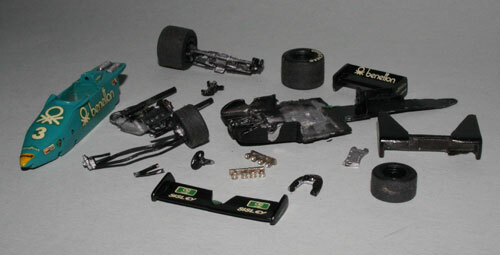 Sidepods, rear suspension and rear wheels glued in place. 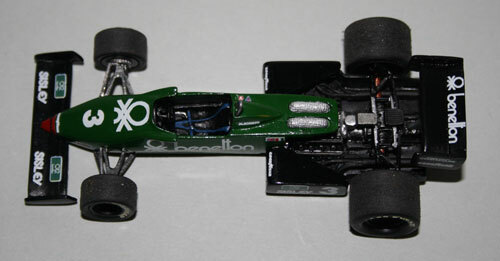 Apart from attaching the rear wing, nothing else can be done until the main body is painted green. 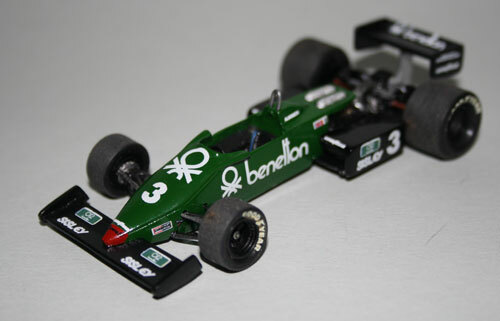 Just body decals, front wing, roll hoop and (very fiddly!) front suspension to go. The finished rebuild. 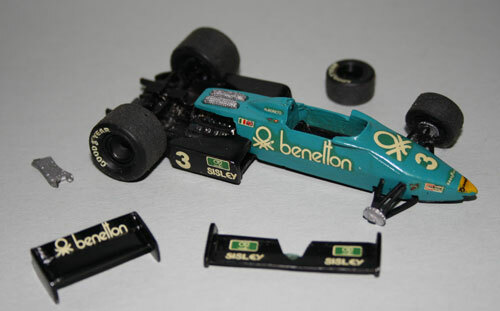 Alboreto’s car had the red-tipped nose early in the year before it was changed over to fluro yellow, along with some other changes to the car’s markings. I made the missing roll hoop out of a piece of thin wire.